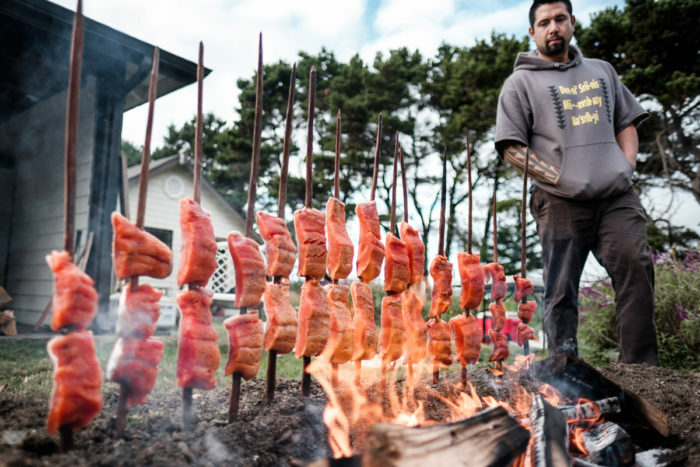 Members of the Tolowa Dee-ni’ Nation are keeping traditional foodways alive in the face of climate change and human impact. As the sun falls and rain clouds linger, Jaytuk Steinruck drives an ATV up a northwest corner of California’s shore to gather duuma (sea anemone) from tide pools near Setlhxat (Prince Island) for a feast made from traditional Tolowa tribal foods. About halfway up, Steinruck points to his family’s fish camp. They are one of only two Tolowa families that continue to sun-dry lhvmsr (smelt) on sand or beds of grass as their ancestors had done. This beach at the tip of the redwood forest is also where met’e (razor clams), a food also long part of the coastal diet, had been plentiful until the 1970s when the Tolowa began to see the disappearance of the elongated shellfish marked by a tongue-like body. As he gathers the spongy, green anemone that will later be breaded and fried like calamari, Steinruck also talks about the disappearance of another important part of the tribe’s diet: smelt. The small, silver feeder fish that the Tolowa Dee-ni’ once relied heavily upon has become scarce. As many Americans settle down to their version of a Thanksgiving feast this week, the Tolowa are thankful they have maintained their traditional foodways in the face of the destruction and loss caused by the invasion and onslaught of California’s early settlers. The feast’s convener, Marva Jones, rolling Indian Bread. Photo © Adam Sings In The Timber. Despite the more than 164-year assault on the North Coast’s native peoples and their indigenous foodways—from outright persecution and slaughter in the 19th Century to policies today that restrict indigenous rights—as well as a slew of acute environmental transformations, the Tolowa Dee-ni’, which currently include 1,609 tribal members, continue to practice their traditions today. 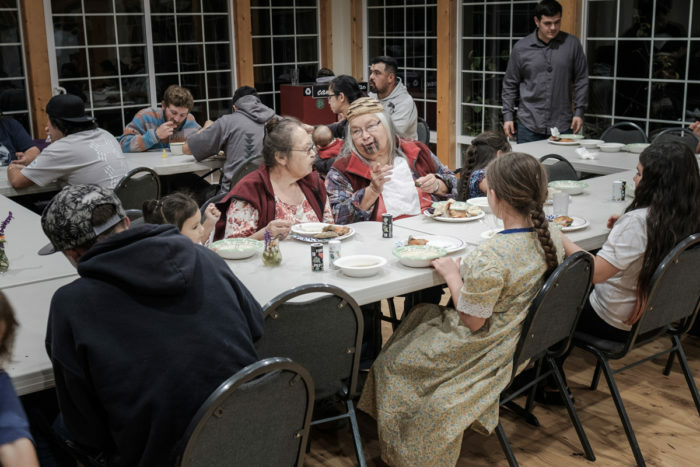 Early in November, gathering at their cultural center in Smith River one mile from the Oregon border, Tolowa and Yurok families celebrated a meal of traditional foods including salmon, acorns, deer, elk, smelt, sea weed, sea anemone, clam chowder, sand bread, lamprey eels, and blackberry pie. Steinruck, who brings his duuma harvest from the day before, pulls Chinook salmon from vacuum-sealed bags. Carefully cutting the fillets into three- to four-inch-wide steaks before sliding them onto large skewers carved from redwood, he smiles a bit as the meat begins to sizzle. Guylish Bommelyn roasting salmon on the fire. Photo © Adam Sings In The Timber. He turns somber as he talks about these ancestral staple foods dwindling as a result of climate change—as well as policies that prohibit the Tolowa from managing their natural resources. A tribe’s access to its resources depends on whether rights have been negotiated with the state or federal government. 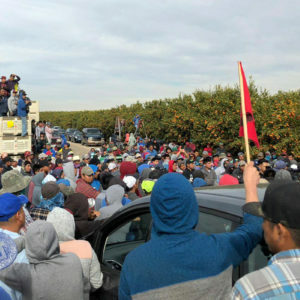 Tribes like the Tolowa, who were disbanded by the U.S. government during the 1950s and 1960s and reinstated decades later, often face cumbersome legal hurdles in trying to secure those rights. Changes in tribal food systems and lifeways began in 1853 as the California Gold Rush brought a mass incursion of white settlers. Making way for the newcomers and addressing the “Indian problem,” California paid a bounty for Indian scalps, which proved to be more lucrative than panning gold. The first session of the California State Legislature passed the Act for the Government and Protection of Indians in 1850, which legalized removing Natives from their land and separating Native families. Ceremonies were ambushed and villages were burned. In 1856, the U.S. government forcibly removed 1,834 Tolowa to coastal concentration camps. By 1910, like many California tribes, the Tolowa population had dwindled—from more than 10,000 to just 504. Despite the 14th Amendment, the Act for the Government and Protection of Indians was not fully repealed until 1937. Relying on the knowledge held by the few families refusing to give up their traditional ways, the Tolowa persevered. Despite shrinking harvests, the family continue to fish for smelt near the mouth of the Smith River. Even if the fish aren’t running, the Tolowa presence reminds nearby landowners of the tribe’s inherent right to these waterways. 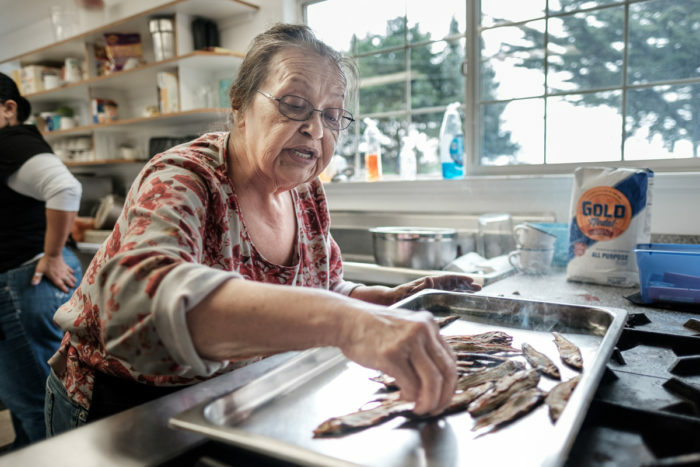 Tolowa elder Vicki Luuk’vm naaghe’ Bommelyn with dried surf fish. Photo © Adam Sings In The Timber. Their ancestral land lies both in California and Oregon. Surrounded by salmon-producing rivers that feed into the ocean, the Tolowa are bound by both state and federal laws preventing them from fishing salmon with traditional nets. State and federal blanket hunting and fishing bans have been applied without discretion and have affected natives disproportionately. Now, some tribes, such as the Tolowa Dee-ni’ must reclaim their rights in court. In addition to smelt and salmon, the Tolowa Dee-ni’ revere the Roosevelt elk as important food, though it too is impeded by policy. Because the elk are currently under federal protection as a response to past over-hunting by white settlers, the Tolowa are denied the right to hunt, and instead are only permitted to harvest meat by salvaging roadkill, even though a recent population increase has made the elk a nuisance to farmers as well as a highway hazard. 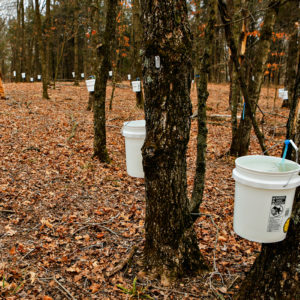 In search of better solutions, the tribe is developing a harvest code based on a study combining traditional ecological knowledge and scientific data. This code will aid in management of subsistence food sources and provide guidance to state and federal regulatory agencies. “It is possible to sustainably harvest wild game with better management of the forest, prescribed burning, and responsible harvest,” says Guylish Bommelyn, a hunter and language teacher at the Tolowa Dee-ni’ Nation. 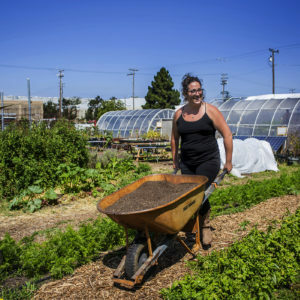 The Tolowa Dee-ni’ Nation, most of Del Norte County, and neighboring tribal lands of the Elk Valley Rancheria and Yurok reservation, are all classified as food deserts by the U.S. Department of Agriculture (USDA). Outlying communities, including tribal communities, rely on small convenience-type stores with limited offerings of whole foods. 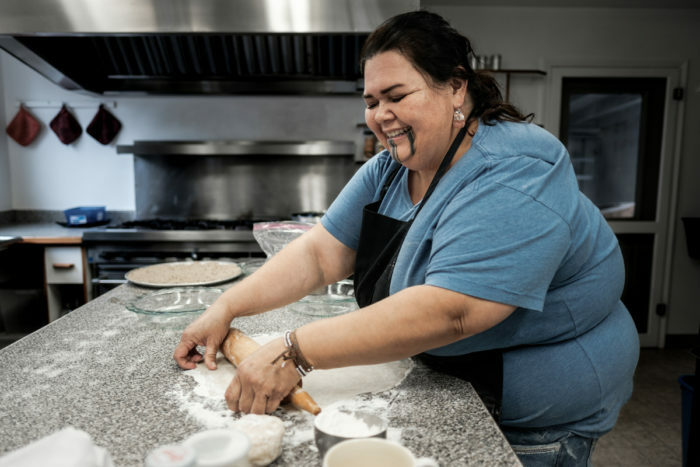 In general, Native Americans in the U.S. suffer from high diabetes and obesity rates: 17 percent of adult Native Americans have diabetes and 43 percent are obese as opposed to 6 percent and 28 percent, respectively for non-Hispanic whites. Bommelyn’s goal to help keep his family healthy entails relying on the land for food. While watching deer steaks roast on skewers next to salmon, Guylish explains how the hunting grounds have been parceled and sold to timber companies. Logging has also impacted elk and deer habitat, destroying prairie and grasslands. Tribal members now buy hunting tags and hunt according to state law, which limits their take to two deer per year. At a nearby fire, Steinruck’s partner, Cyndi Ford, bakes acorn flour sand bread patties in hot beds of beach gravel as eels roast on hot coals. A tribal language teacher, Ford sprinkles Athabascan Na-dene words throughout her conversations. 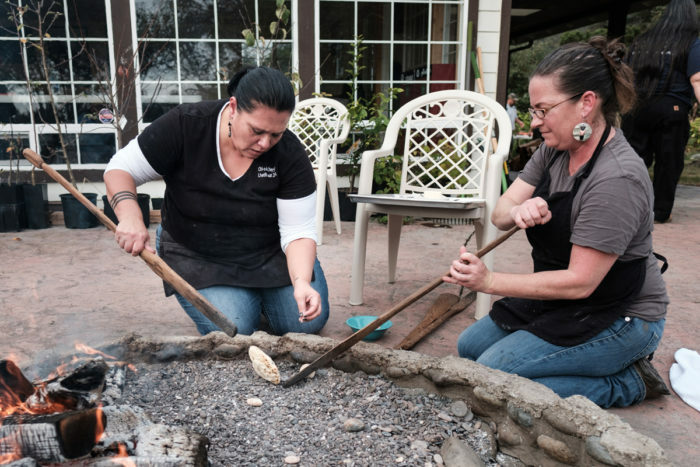 Suntayea Steinruck (left) and Cyndi Ford (right), cooking Acorn Sand Bread over hot pebbles. Photo © Adam Sings In The Timber. As darkness falls and the last of the lamprey eels are brought inside, it starts to rain. The aroma of fresh seafood, nutty acorn soup, and sand bread permeates the cultural center. The group of about 20 people—mostly family—gathers in a circle before the full-course traditional Tolowa meal is served. Steinruck’s sister, Suntayea, and cousin, Marva, sing a song of thanks and offer a prayer that silences the hungry crowd. Elders eat first, then everybody enjoys. Vicki Luuk’vm naaghe’ Bommelyn (left) and Bertha Peters (right) at the Tolowa Dee-ni’ feast. Photo © Adam Sings In The Timber. This is the first in a series of articles to be published by Civil Eats in partnership with GATHER, a documentary chronicling the movement for Native American Food Sovereignty. 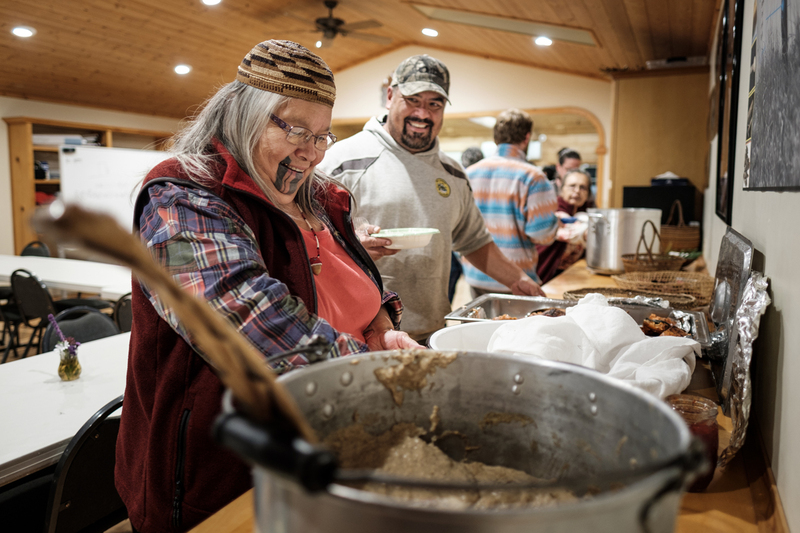 Top photo: Yurok elder Bertha Peters with Jaytuk Steinruck at the tribe’s feast. All photos © Adam Sings In The Timber. Thank you for this well-written and well-photographed article. You share an important story and I look forward to the rest of the articles/documentary. Very well written. We must never forget our passed. Thank you for writing these Civil Eats articles informing about the movement to perpetuate indigenous people's culture and diet and to harvest sustainably combining cultural wisdom and scientific knowledge. I live in the South. Both sides of my family have Native American heritage. This was a great article, but sad and hopeful at the same time. As a child I ate smelts all the time, but no one seems to know anything about them. Daddy is dead, so I cannot ask him anything.